Incontinence surgery is rarely performed prior to the completion of a woman’s childbearing. 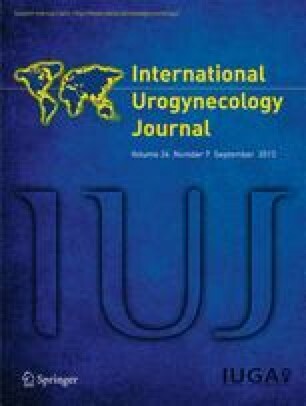 The literature is sparse in regard to women with prior incontinence surgery. There are no reports of pregnancy complicated by a sling procedure. A 26-year-old gravida 3, para 2-0-0-2 with prior surgical history of a Pereyra urethropexy followed by a Vesica suburethral sling, was referred at 18 weeks’ gestation for assessment of the sling. Her antenatal course was complicated by pyelonephritis and intermittent urethral obstruction requiring Foley catheter placement. She delivered by scheduled cesarean section at 37 weeks’ gestation. Three months following delivery she presented with pyelonephritis and recurrence of her incontinence. Pregnancy complicated by prior suburethral sling procedure may result in urinary outlet obstruction, pyelonephritis and disruption of the surgical repair.